This is another episode of Previously on Amara and comes from the summer of 2007, also known as the Summer of the Pumpkin. Amara would have been three years old then and she loved helping Grandma in the backyard. 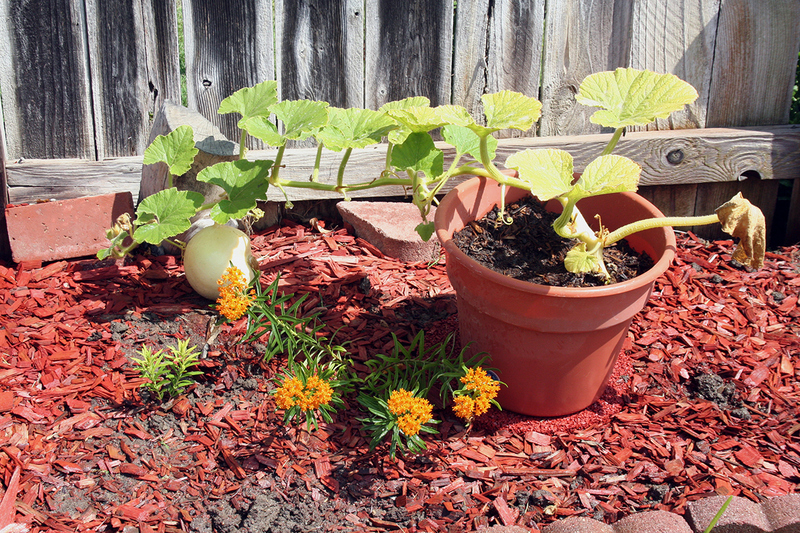 I was reading Grandma J’s blog the other day and she wrote how she wanted her grandchildren to have a chance to grow their own Halloween pumpkins. 5 years ago I had wanted Amara to have a chance to do the same thing. Unlike Grandma J we didn’t have any place to grow pumpkins in AmaraLand. 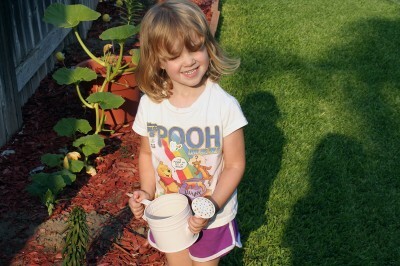 And we certainly didn’t have a place to build a cool green house for the pumpkins like shes doing. But back then I thought it would be fun to try growing them from seeds in a big pot. It works for tomatoes why not with pumpkins? These are our 2 little seedlings just after they came up. These were to be our giant pumpkins. It had said so on the package of seeds. It wasn’t long before we had little flowers and the beginnings of a vine. We were both excited and our hopes were up that we would have pumpkins! 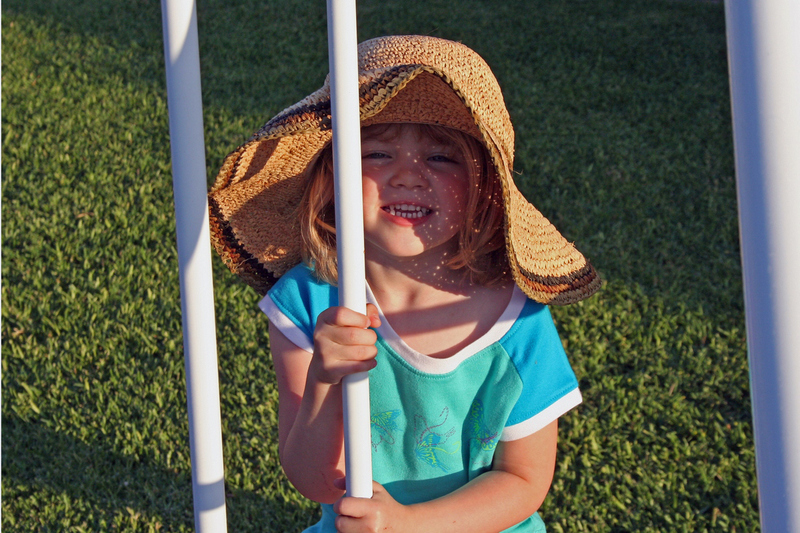 Amara would sometimes wear Grandma’s hat out to the garden. And of course any trip to check the backyard meant you had to take time on the swing set. The little flowers were just fascinating for both of us. The bees and the ants seemed drawn to them, too. I took this as a good sign. Amara had her own little pink watering can. 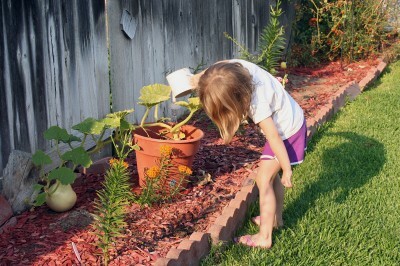 Little pumpkins stand a much better chance of surviving a 3 year old with a watering can than one with a hose. She would run to the backyard to check on it as soon as she got here. 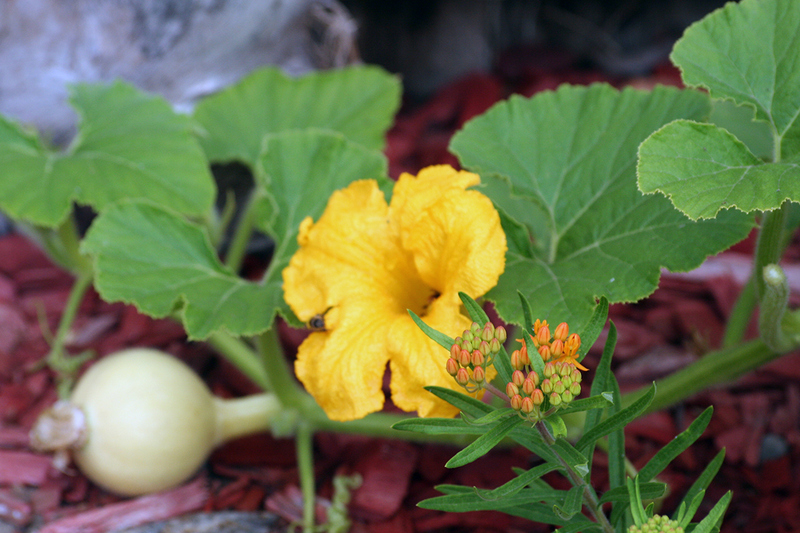 Our pumpkin vine was getting longer and we even had a little pumpkin. Amara continued to water it carefully. 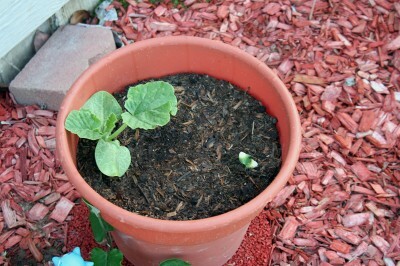 Our one little pumpkin was growing slowly but our vine wasn’t. I had read it could grow as much as 6 feet in one day. Ours never got to 6 feet. This is as big as it ever got. The butterfly weed from Aunt tried to cheer it on. We never got our pumpkin but we did have a wonderful summer. 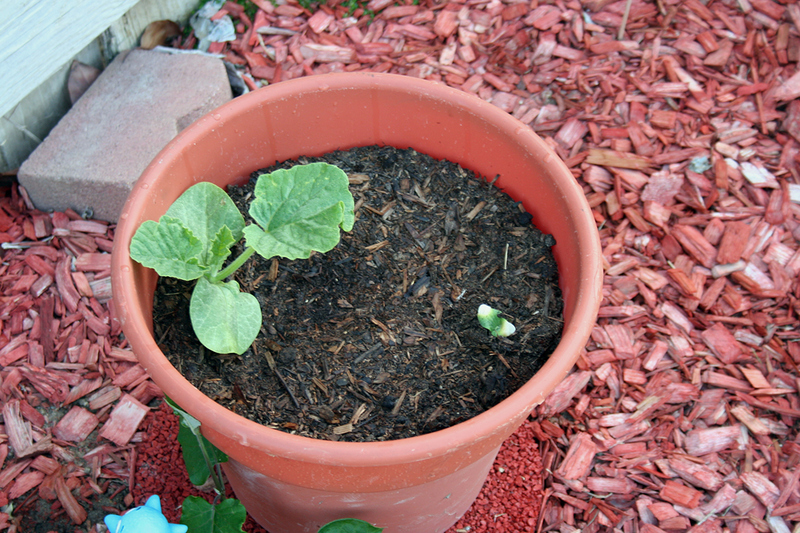 My experiment to grow pumpkins in a pot may have failed, but it didn’t really matter. We’d had fun outside together trying. We will have other experiments that fail, too but we won’t care. We will just keep having fun and making memories. This memory was posted in Previously on Amara and tagged Amara, garden, pumpkin on May 21, 2012 by Grandma Kc. Amara has made every summer wonderful!!! What a sweet, beautifully told story of togetherness between grandma and Amara! Your pictures are lovely, especially the ones of little Miss “you-know-who”! Our pumpkins are now the size of the one in your first photo. I’m not optimistic either, but like you, it will be fun trying! Thanks for a really cute story! All things viney like that are a huge consumer of fertilizer. 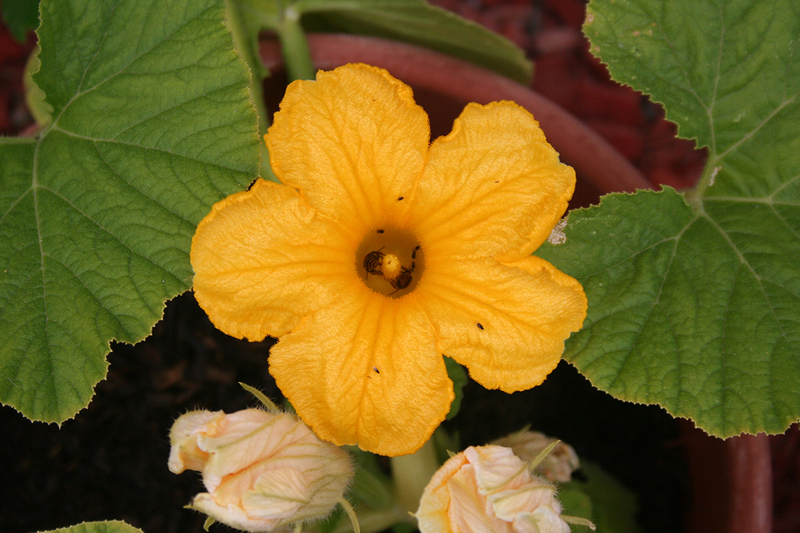 I put the most chicken coop brown gold in the spots where I’m growing winter squash for the pumpkins. You might try again sometime and do the “Jack Be Little” pumpkins. So fun for decorating. Add lots of compost and Miracle Gro or fish fertilizer or something. I am so much more about process than product. I just love seeing what it will do. Good times. 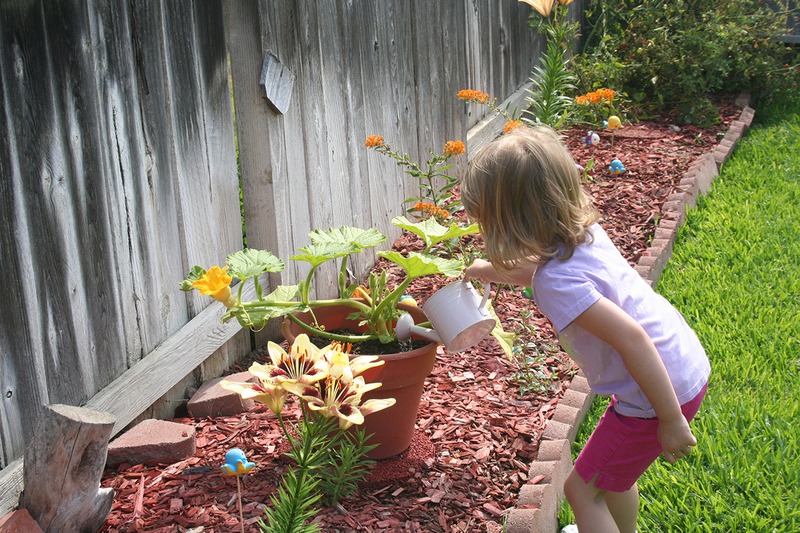 There issomething about gardens that just scream grandmas and grand daughters. 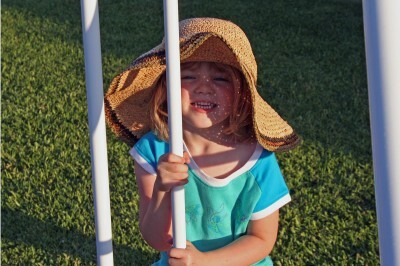 I love seeing these pictures of Amara when she was little – especially the one where she is wearing your hat!! Precious! 🙂 What great memories for you all!!! Precious photos and time, it seems, despite no fruits of your extensive labors. 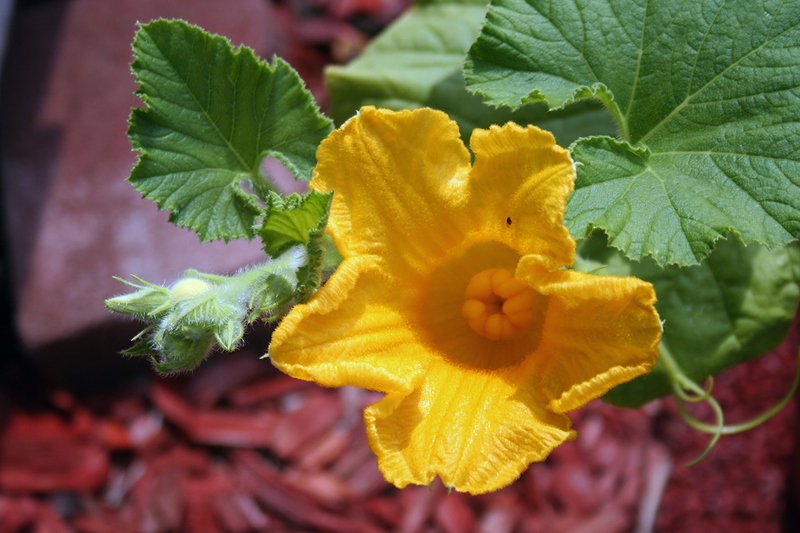 I have a heckuva time getting a pumpkin out of my long, flower-festooned vine every darn summer. I’m determined to make it work this summer. The first year we grew pumpkins we had a bumper crop. Every year after, the vines were eaten by insects. But, it wouldn’t be our garden without some pumpkin vines trying to produce pumpkins. This year we are actually trying two giant pumpkins, and are checking them every day to see how they are doing. 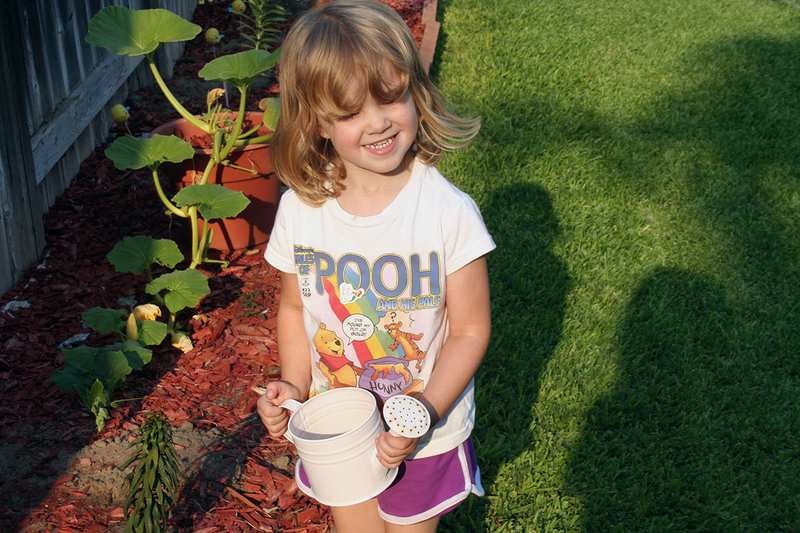 Gardening is a journey that my grandchildren and I go on every year. We have some interesting conversations about how early settlers and even my grandparents grew enough food from their garden to last all year and not just some great summer additions to the menu. If only I could ask my grandfather how he did it.